Le Portugais marks an interesting point in the development of Braque’s paintings. In the top right hand corner, he stenciled the letters “D BAL” and under them, roman numerals. Although he had included numbers and letters into a still life in 1910, they were a representational element of the painting. In this piece, the letters and numbers are a purely compositional addition. 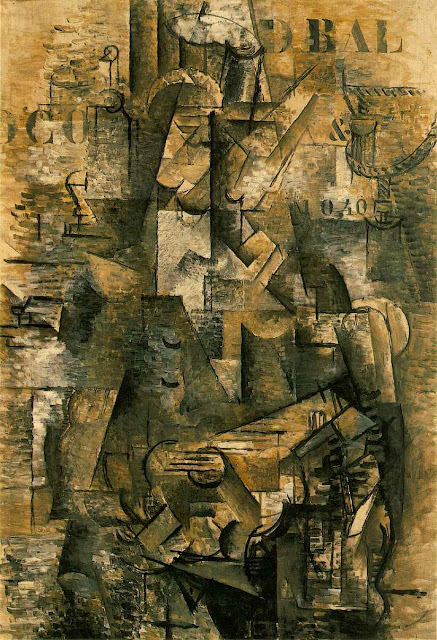 Braque’s intentions at adding the letters are many, but mostly they are added to make the viewer aware of the canvas itself. In representational paintings, the canvas is there only as a surface to hold whatever image the painter desires. By adding numbers, out of context elements, and surface textures, the viewer becomes aware of the fact that the canvas can also hold outside elements, making the surface of the painting just as important as what is put on top of it.